The chief executive of Pfizer has said US President Donald Trump should use trade deals to fight price controls on medicines in other countries. 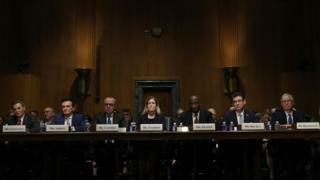 His proposal was one of several put forward by the pharmaceutical industry at a hearing in Washington where firms were grilled about high US drug costs. Senators told the companies the current pricing system is "unacceptable". Pharmacy prices for brand prescriptions in the US increased by almost 60% from 2012 to 2017, according to analysis by research firm IQVIA. While many Americans are shielded from those prices by health insurance plans that cover parts of the cost, experiences vary widely, which has prompted widespread public dissatisfaction. Reality Check: Does UK spend half as much on health as US? Last year, Mr Trump proposed allowing certain government programmes to pay for some medicines based in part on their cost outside of the US. Other lawmakers have focused on easing approval of rival drugs, looking at the patent system, or allowing imports from other countries. "All of you that are here today are here because the way you've been doing business is unacceptable," Senator Ron Wyden, Democrat of Oregon said, accusing them of "profiteering and two-faced scheming". Tuesday's Senate Finance Committee hearing saw seven top drug makers - AbbVie, AstraZeneca, Bristol-Myers Squibb, Johnson & Johnson, Merck & Co, Pfizer and Sanofi - testify . They defended their pricing, arguing that after discounts and rebates, the payments they receive for medicines in the US have in many cases declined in recent years. But they conceded that the overall system has problems and pledged to support efforts by Congress to act. "No one in the system can do it by themselves," said Pascal Soriot, chief executive of AstraZeneca. "The government has to step up and change the rules." Mr Trump's proposal is widely opposed by the industry. Instead, executives urged Congress to focus its efforts on simplifying the price negotiation system and regulating companies that engage in "price-gouging". Mr Bourla, whose products include Advil, Viagra and Lipitor, also said the US should look outside its borders. "The administration should try for trade agreements to protect American innovation," he said. "These price control mechanisms of multiple well-developed countries is in reality a free-riding on American innovation." Prices in Europe are generally lower, thanks to a combination of government intervention and increased competition from certain kinds of drugs, known as biologics. Analysts have said they do not think US customers would benefit from higher prices elsewhere.